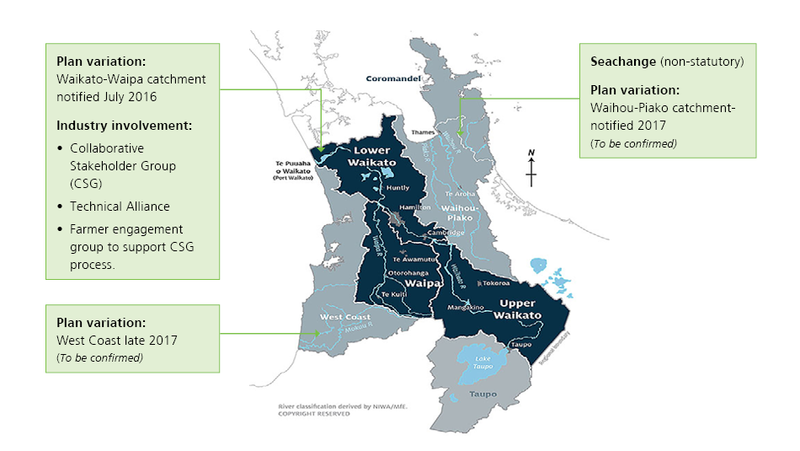 The proposed plan change covers all land in the Waikato River and Waipa River catchments. New rules to reduce sediment, bacteria, nitrogen and phosphorus entering water bodies are already in place and may be changed further through council hearings due to start in December 2018. Existing rules in the Waikato Regional Plan continue to apply, e.g. farm dairy effluent rules, earthwork rules and point-source discharge rules (urban areas and industry). The plan change for the next 10 years is the first step to achieve the Vision and Strategy/Te Ture Whaimana o Te Awa o Waikato of making the river swimmable and viable for food collection along the entire length of the river. The Vision and Strategy was adopted by the Government as part of Treaty Settlement legislation. Information about the hearings is listed on the Waikato Regional Council website here. The hearings are in three blocks. The first is mainly science and economics, the second is mainly about land change restrictions and managing nitrogen (20 May to mid-July 2019), and the third is farm environment plans and sub-catchment planning (alternative approaches - August). If your evidence is longer than three pages of text, then you need to write a summary. Remember you are there to help the panel make a well-informed decision. You are the expert about your farm and what will work in the long term to make the water swimmable and safe to take food from. Consider presenting pictures/maps - If it’s not already in your evidence. It can help tell your story if you have something visual to make your point, e.g. photos, farm map, key page out of any existing farm plan etc. Keep your presentation to about half the length of your time slot. This gives the panel time to ask you questions. Ideally this is a conversation between you and the panel about how the current rules impact you, and what would work better. Federated Farmers: Workshops open to anyone who wants to prepare for the hearings on 8 April in Gordonton and Te Awamutu, find details here. Go to Waikato Regional Council website here. Section 42A report. This is prepared to help guide the hearings panel. It gives a summary for each block of hearings for PC1 and recommendations for changes – this is called the Council Officers report or section 42A report (the council is required to produce this under s42 of the RMA). DairyNZ evidence, listed on the council website under ‘submitter evidence’. For an overview of the technical evidence and a summary of the DairyNZ approach see Evidence of Justine Young. Where do I get information and find certified advisors with a good understanding of farm systems? Developing Farm Environment Plans and Nitrogen Reference Points requires a certain level of farm systems experience. Waikato Regional Council (WRC) is working through the criteria in terms of qualifications and experience required for advisors who will be completing Farm Environment Plans and Nitrogen Reference Points. Names of accredited advisors will be posted on the WRC Healthy Rivers web page. In the meantime, a Nutrient Management Adviser Certification Programme has been established to accredit nutrient management advisers in New Zealand. For more information about the programme and a list of certified advisers click here. As with any sale or purchase, we recommend that you undertake due diligence and contact your lawyers for independent advice on how the proposed plan change might affect any sale or purchase agreement. How will the difference between current N loss and the 2019 Nitrogen Reference Point be calculated? The nitrogen loss figure dairy farmers currently have from their nutrient advisor or milk supply company is the nitrogen leaching figure from the current version of Overseer. The Nitrogen Reference Point to be used after 31 March 2019, will be the figure that farms must meet, and will be based on the version of Overseer available at that time. Therefore, the N loss figure used at present is not the definitive Nitrogen Reference Point for the farm, but rather an indicator. To read more about Nitrogen Reference Points click here. How will the Nitrogen Reference Point, and the information used to calculate it, be verified? The information entered into Overseer to produce the nitrogen leaching figure will be based on data input methodology outlined by Waikato Regional Council in the plan change. Under the proposed plan, the WRC will use the NRP information supplied as a benchmark to work out the 75th percentile nitrogen leaching value for dairy farms. Any industry scheme or consents will have quality control processes in place. A cross-section of Farm Environment and Nitrogen Reference Point plans will be audited. How will non-compliance be dealt with? Non-compliance will be dealt with in the same way it is for any other form of non-compliance e.g. effluent. What happens if I want to intensify my farm system? The farm system should be adapted so you continue to meet the reference point or get below the 75th percentile. To read more about nutrient management click here. Where are the priority catchments and what are the development timeframes? To see the Waikato Regional Council farm mapping tool click here. This will show you which priority catchment you are in and the timeframes that you must meet. Note that if your farm is in the 75th percentile for nitrogen loss, then you are automatically in a priority one catchment. Can 'off-setting' be used to manage overall N loss within a catchment? Not under Plan Change 1. Instead, landowners can make adjustments within their own enterprise if it is in the sub-catchment. Council maps are available here. WRC defines ‘enterprise’ as one or more parcels of land held in single or multiple ownership to support the principle land use or land which the principle land use is reliant upon, and constitutes a single operating unit for the purposes of management. An enterprise is considered to be in a sub-catchment if more than 50 percent of that enterprise is within the sub-catchment. For example, if you own two blocks of land and they are in the same sub-catchment, you can have a Nitrogen Reference Point which covers an enterprise. At the moment, Healthy Rivers Plan Change 1 doesn’t have trading or off-setting rules that allow for one landowner to increase discharges if another property decreases by the same amount. This is an idea that some people think should be used in the future. For more information on Healthy Rivers with information sheets and answers to frequently asked questions click here. In September 2016, Waikato Regional Council voted to publicly notify the Proposed Waikato Regional Plan Change 1 – Waikato and Waipa Catchments. The plan was developed using a collaborative process with iwi project partners, farming sector and community representatives, non-government organisations and council who have worked together to shape a solution. The industry will still need to work towards the rules as they were notified. It is likely that the plan may change as it works its way through the hearings and appeals process. Certification programme for Nutrient Advisors and Farm Environment Planners is underway. WRC will run workshops to help you prepare. Land management training courses are being run for consultants to upskill in this area. A portal is being developed for registration of all farms above 2ha and for lodging nitrogen reference points. To read more about Farm Environment Plans click here. Click to view the Healthy Rivers map.